Our lockable snapframes which offer a security feature in the form of a key lock and sequentially opening sides, are ideal for use in unmonitored locations. 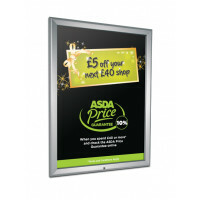 They can be used for for both indoor and outdoor displays. These lockable snapframes are available in different colours and sizes, with anti-glare poster cover sheets that are UV stable. Further, all the methods of fixing and opening these snapframes are hidden from view after they are closed. We invite you to sift through our vast range of lockable snapframes. Chances are, you might find the most appropriate lockable snapframes to fulfill your unique requirements.